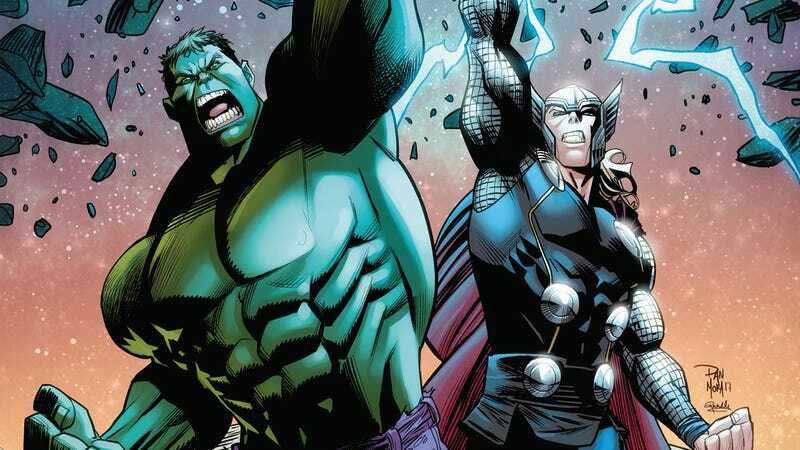 The trailers for the upcoming Thor: Ragnarok promise an epic gladiator match between Thor and Hulk on the big screen, so naturally Marvel is getting the two heroes together for some fisticuffs on the comics page. Thor Vs. Hulk: Champions Of The Universe is the second Marvel series exclusive to ComiXology after The Immortal Iron Fists, and there are two ways to get a hold of the miniseries: Buying digital single issues for $2.99 (a dollar cheaper than the current Marvel standard), or having a subscription to ComiXology Unlimited, which gives readers free access to the series. Written by Jeremy Whitley with art by Simone Buanfantino and colorist Irma Kniivila, Thor Vs. Hulk forces the two leads to beat each other up in a series of trials that determines who will fight the Champion, an Elder of the Universe. Each issue takes Thor and Hulk to a new locale with new challenges, but no matter where they end up, the final goal is the same: hit your opponent until he can’t get up. This exclusive preview of Thor Vs. Hulk: Champions Of The Universe #1 begins before the brawl with the pair destroying asteroids that have been propelled toward Earth’s atmosphere by an alien spaceship. They might be friendly, but they’re still competitive, and their game of “who can destroy the most space rocks” gets violent by the end. They both know that the other is basically invulnerable, so they can get aggressive like this without consequence. But what happens when they’re put in a position where they have to try to actually hurt their teammate? These pages show that Buanfantino and Kniivila know how to create crisp, explosive action that captures the raw power of these characters. There’s also a lot of expression in their faces and bodies: Black Widow’s self-assurance at the end of the first page, Thor’s unbreakable cockiness, Hulk’s frenzied need to prove he’s the strongest there is. Readers can witness this superhero showdown by grabbing Thor Vs. Hulk: Champions Of The Universe #1 when it hits ComiXology next Wednesday, and it’s available for pre-order now.